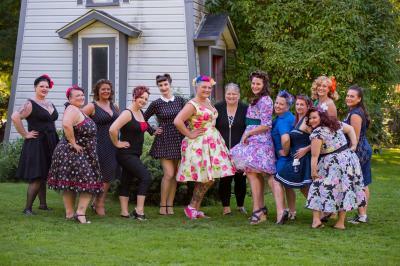 Pin-up models pose during the 2016 event. From iconic vintage cars, to retro jukebox music and pin-up fashion, these pieces of Americana are being preserved at Penny's Pin-Up Party, hosted by The Great Lakes Bombshells and Pin-up Erie Photography. Retro-loving folks of all ages are invited to the newly revamped vintage venue, Conneaut Lake Park and Hotel Conneaut for a day of delight. Starting at 1 p.m., there will be activities such as a classic car cruise, DJ sets, food and pin-up contests for young ladies and gents. There are opportunities for all attendees enjoying vendors, carnival games and more, to be picked as "Best Retro Dressed" for multiple categories. When the sun goes down, the pin-up party goes up a notch. The second half of the day long event will begin at 8 p.m. in the lower ballroom of Hotel Conneaut. The theme of this 21+ event is "Diamonds are a Girl's Best Friend." Glittering gals can dress up in their most glamorous, vintage Hollywood garb and take to the dance floor for music by headlining band Kickstart Rumble and burlesque performances by Moon: Variety Artist and Eden Ivy. During this time the crowning of Miss Pin Up Erie 2018 will take place. The gala is a place for more than just the Miss Pin Up Erie contestants to strut their stuff, said Penny Shaut, owner and photographer for Pin-Up Erie. "We believe there is a Bombshell in every woman and she deserves to feel special in her own skin." All proceeds from Penny's Pin-up Party benefit Boro Women & Family Services, an organization which helps women and families in crisis situations.